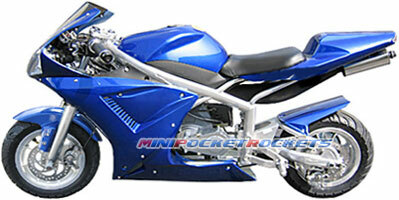 The X7 Bullet super pocket bike is a MiniPocketRockets' exclusive bike. The ultimate blend of form and function, we are the only company that produces and carries this high-end model. Designed from the ground up, the X7 Bullet bike showcases its radical design through a series of concave and convex planes on its sculpted fairings. Inspired by its larger GP Moto siblings, the X7 super bike's frame features a mandrel-bent tubular racing chassis that is both stiffer and more durable than other super pocket bikes in its class. An adjustable racing suspension is fitted for maximum control and traction while reducing unsprung weight on both ends. A ZR motorcycle alternator eliminates the need for a battery charger, as power is automatically generated through friction and heat as this super bike is ridden. This translates into constant power for its extra-bright headlights, taillights and signal lights. The X7 Bullet also features triple racing gauges, horn and an electric start for its race-tuned 49cc gas powered engine. Turn the key and fire up the high-revving engine. Performance gains are realized through a high output exhaust system and advanced intake management. Tire scorching torque is achieved through racing gear ratios while blazing top speed is accomplished by the engine's higher RPM redline. A removable adjustable speed governor is also pre-installed for the faint of heart. From the padded leatherette seat to the racing treaded tires, the X7 Bullet super pocket bike was designed with every detail in mind. Everything on this pocket bike can be adjusted to accommodate riders of all sizes including the suspension, handlebars and riding position. Dual cross-drilled disc brakes ensure fade-free stopping every time. The X7 Bullet super pocket bike comes fully assembled and ready to shred the pavement! Included Free with X7 Super Pocket Bike: Gas Mixture Bottle & Cap, 2 Sets of Keys, Tools (sockets, screwdrivers, allen wrenches), Tool Case, Spare Fuses, Owner's Manual and our free extended warranty.